Video Tour - Coming Soon! Here at Hotel de Rome we are proud of our 3 stars! Take a look at our video tour and see the sheer luxury you can expect as a guest at our hotel. 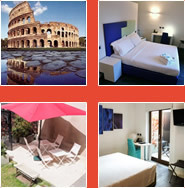 Our luxurious 3 Star Hotel in Rome has a number of contemporary guest rooms available in single, double/twin or suites.